@patofoto - Glad it helps. This was always something we wanted people to do. If we have time, we’ll probably make a batch of something different too. It will take a little bit of gentle tapping to get it off. Hmm. Mine didn’t take much to pull off. I didn’t turn anything upside down. 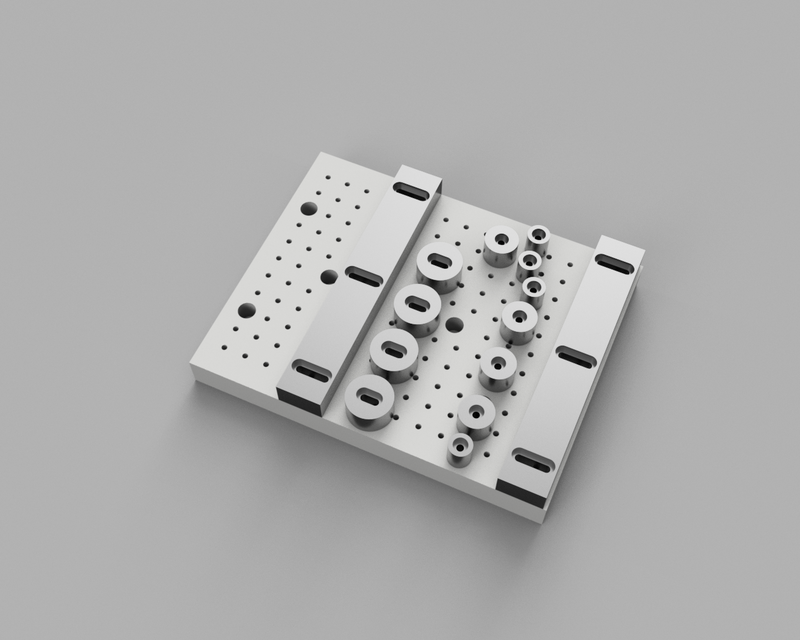 Depending on the day and serial number, there are a number of pin types and Loctite combinations that have been used on the table. (And this is one of the biggest points of contention between different people in the shop) Later machines should be using undersized pins and less Loctite to make table removal easier. You may have to turn the machine on it’s side and use a small punch to tap the dowel pins out from the bottom. This is table I’ve built to clamp things down.I’ve used Delrin but I didn’t like how it turned out .Its self-lubricated characteristic is perhaps what I should avoid the most. Maybe I should try Aluminum. The hardest part was to tap all the holes manually (actually, used a drill). Thread mills are very expensive ($80~$150) but I may eventually try them out. interesting system … though unless i’m missing something, at 14" wide it won’t fit in the nomad. A modular system like this for about $100 seems worth every penny. I’s be super interested also!! I would be very interested in this, too. 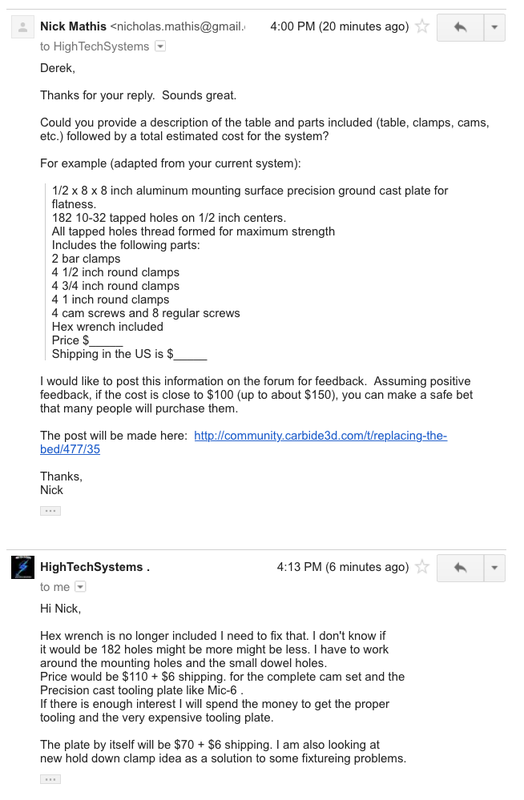 I sent him the PDF of the table dimensions and he is checking on how much it would cost to make it. Stay tuned! If its somewhere around $100, I’m in. Staying tuned!!. I’m also in!.. I’m also in! Keep us posted. I will keep you all updated as I find out more. Sign me up! Including 20 characters so the forum will let me post. What I wanted to mean was that I made the design to fit Nomad, not that HighTech’s bed would fit the Nomad. I’m in for a bed like this. Thanks! I’m in! Sounds like a great way to facilitate holding stock. 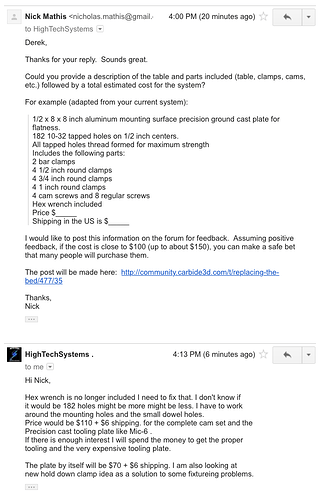 Would love to hear what our great folks at Carbide 3D think of this. Any comments?.